From snake charmers, we are now a nation of mouse charmers. Our youngsters are shaping the world with the click of a mouse with their feats in the IT sector. I didn’t become CM on 07-10-2001. I have always been CM, i am CM today and shall be CM forever. For me CM means not Chief Minister but Common Man. I assure the citizens of Gujarat that tomorrow is even brighter, i assure the people of Gujarat that tomorrow is more progressive, i assure the people of Gujarat that tomorrow is even happier, more prosperous, tomorrow is more peaceful and more positive. Sports must become an indispensable and inseparable part of our social life. Competitiveness is just a by product. Woman is an incarnation of ‘Shakti’- the goddess of power. If she is bestowed with education, Gujarat’s strength will double. Let the campaign of ‘Kanya Kelavni’ be spread in every home. Let the lamp of educating daughters be lit up in every heart. Then only the vision of ‘Jay Jay Garvi Gujarat’ will be realized. The quality of education today decides the tomorrow of Gujarat… Government may build schools, but the future can be built by the schools only. The key responsibility of building Gujarat’s tomorrow thus lies with the schools. Many celebrations are set to take place in Swarnim Gujarat. However, if one asks me, “As the Chief Minister, which is your favourite programme?” Then friends, i would like to say that ‘Vanche Gujarat’ is the closest to my heart. If the 21st Century is the era of knowledge and of knowledgeable human-force, then, to extol this force, Gujarat must form a strong bond with books. People who don’t believe in dreams might mock our dreams or find them funny, but i want to see these dreams… I want to enable Gujarat to dream… I want to create circumstances in which the entire world stands as witness…to Gujarat fulfilling these dreams. We must reach out to villages even in scorching heat with temperature upto 44 C. We must ensure that no girl child remains illiterate. I request all the social institutions and the media world to create a joyous environment for education in the month of June (when schools re-open), an environment to encourage children to go to school. We will derive the satisfaction of having done a social good. Team work is the essence of good governance. It is necessary to form a team within the party and also within the administrative system. We feel very proud and privileged to be born in the land of Gandhi, to be speaking the same language as Gandhi did, to be living on the banks of the river where Mahatma built his ashram. The basis of democracy is tolerance to criticism. If you can’t face criticism, if you can’t accept it, then you cannot guard democracy, you are not eligible for it. I don’t look at sports as something which merely tones up the body. I look at it as a tool of education that stimulates the mind and brings in a culture of discipline. Narendra Damodardas Modi is the 15th and current Prime Minister of India. 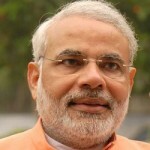 Modi, a leader of the Bharatiya Janata Party (BJP), also served as the Chief Minister of Gujarat from 2001–14. He is currently the Member of Parliament (MP) for the Varanasi constituency. Modi was a key strategist for the BJP in the successful 1995 and 1998 Gujarat state election campaigns. He became Chief Minister of Gujarat in October 2001 and served longer in that position than anyone else to date. He led the BJP in the 2014 general election, which resulted in an outright majority for the BJP in the Lok Sabha – the last time that any party had secured an outright majority in the Lok Sabha was in 1984. Modi is a Hindu Nationalist and a member of the Rashtriya Swayamsevak Sangh (RSS). He is a controversial figure both within India as well as internationally as his administration has been criticised for the incidents surrounding the 2002 Gujarat riots. Modi has been praised for his economic policies, which are credited with creating an environment for a high rate of economic growth in Gujarat. However, his administration has also been criticised for failing to make a significant positive impact upon the human development of the state. In 1978, Modi graduated with an extramural degree through Distance Education in political science from Delhi University. In 1983, while remaining as a pracharak in the RSS, completed his Master's degree in political science from Gujarat University.